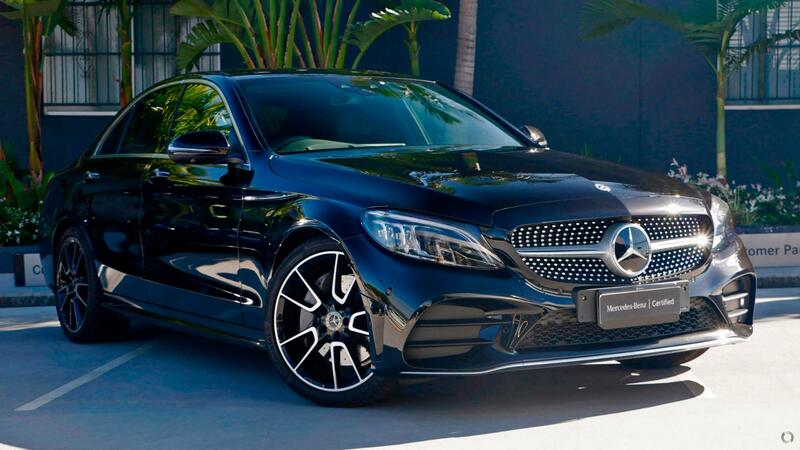 This Certified NEW GENERATION FACELIFT C300 sedan finished in Obsidian Black with Black AMG Leather, is complimented by the AMG Pack featuring 19" AMG Alloys, AMG bodystyling, sports seats, and sports suspension. Additional features include the Seat Comfort Pack with heated front seats and memory function; COMAND Pack with Burmester sound system, traffic sign assist, and online accessibility; Vision Pack with panoramic glass sunroof, Multibeam LED Intelligent Light System, 360 degree camera and head-up display. This 2018 FACELIFT C300 sedan is not to be missed. To ensure you are covered by a comprehensive after sales experience we offer the balance of your new vehicle warranty and roadside assistance. We are Queensland's largest authorised Mercedes-Benz Pre-Owned Dealership located just 5 minutes from . All of our immaculately presented Certified Pre-Owned Vehicles undergo an extensive 120 Point Check by our factory trained technicians using only genuine parts giving you complete peace of mind. Interstate enquiries are always welcome so please call and speak to one of our friendly consultants who can arrange a smooth and hassle free purchase experience. For local enquiries if you are unable to make it in to see us we will happily bring the vehicle to you! Our on-site Business Manager is ready to attend to all of your Finance and Insurance needs. We are always buying quality Pre-Owned vehicles so if you are looking to trade your current vehicle our on-site professional valuer is here to ensure you achieve the best possible price for your asset.